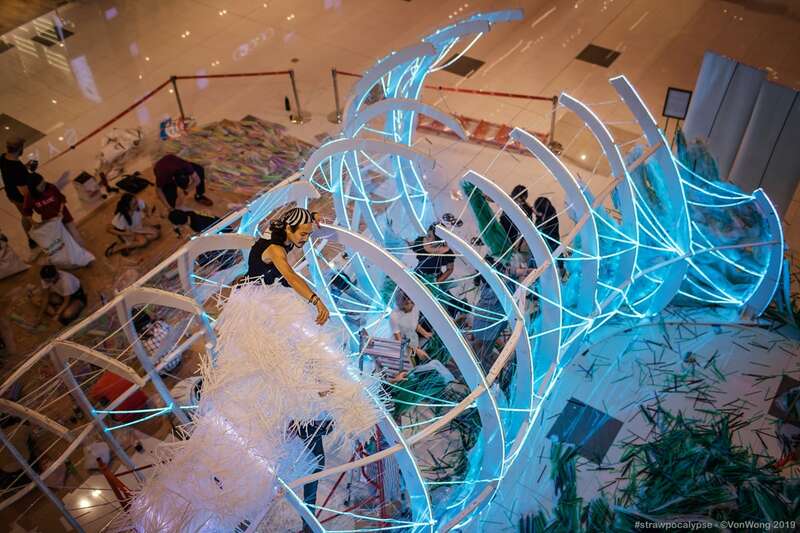 In the lobby of Estella Place, a new retail podium in the prime District 2 of Ho Chi Minh City, stood a gigantic model of parted sea waves constructed from 168,000 used plastic straws. 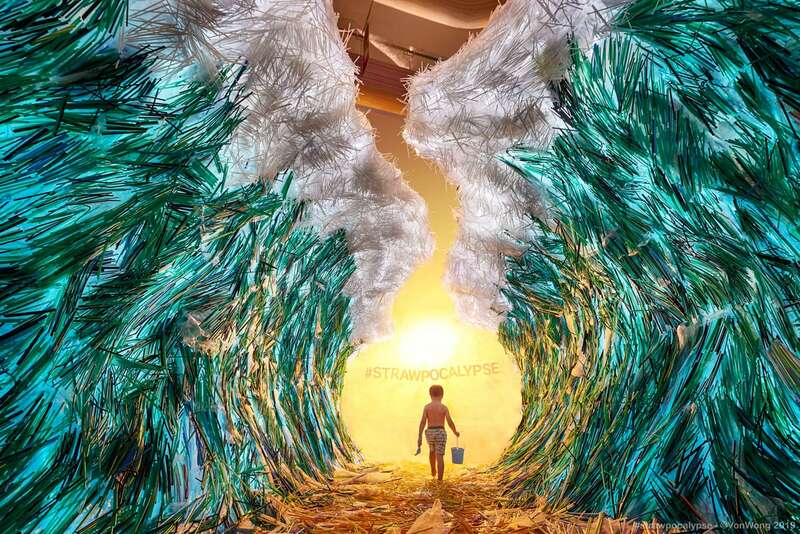 Leaving visitors fascinated yet bewildered, Strawpocalypse: The Parting of The Plastic Sea is hyper-realistic artist Benjamin Von Wong’s latest art installation. A Canadian engineer-turned-artist, Von Wong is known globally for his viral narratives around environmental issues. His artworks weave installation, photography, positive storytelling, and mankind’s forgotten waste into shareable experiences. It's just one straw… said 8 billion people. 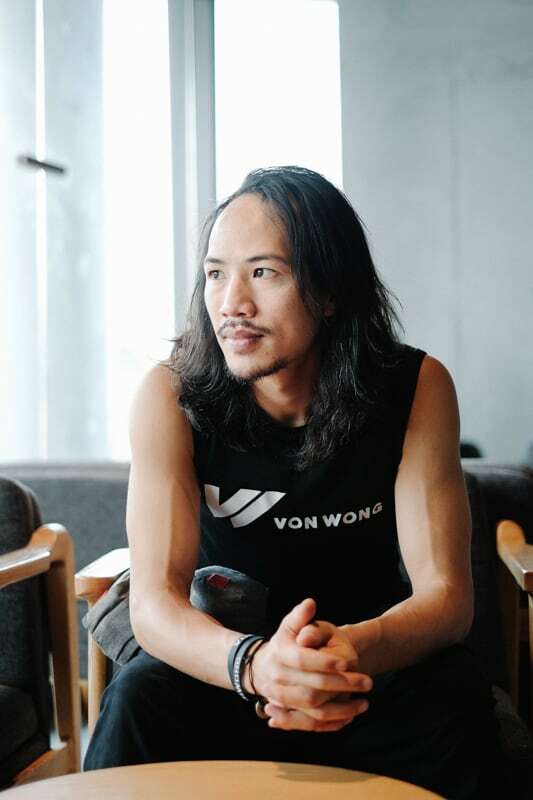 In 2018, Von Wong pinned Vietnam on the map as one of his destinations. The country’s notorious plastic pollution moved him. 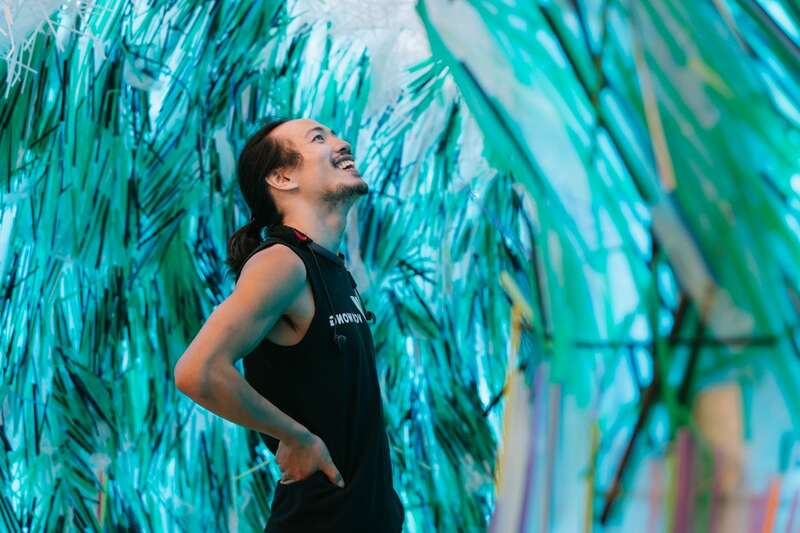 “Strawpocalypse could easily represent the amount of straws consumed every minute in Ho Chi Minh City,” said the artist. Vietcetera met with with Von Wong at Starbucks Vietnam, the project’s sponsor, as he shared with us the making of his most recent viral story. 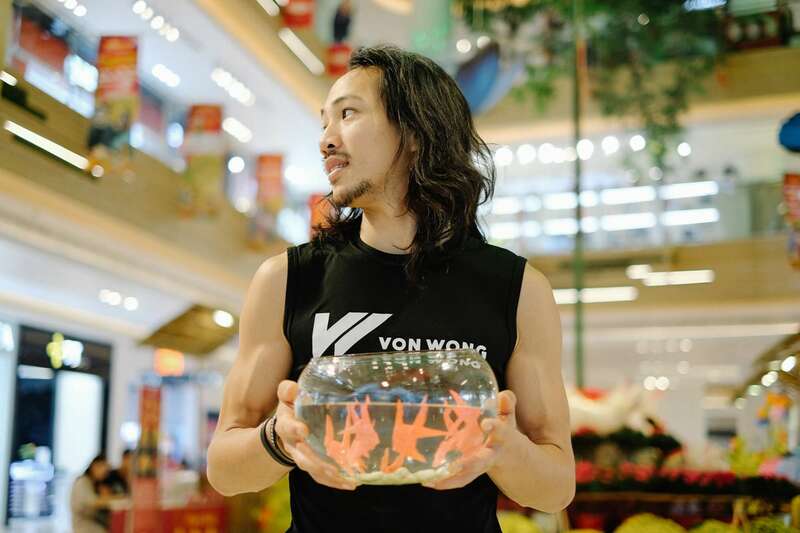 “Frankly, I think we’re doomed,” said Von Wong about plastic pollution. Is Strawpocalypse a commercial project or a personal project? Strawpocalypse is more of a personal project. No one on the core team is getting paid. Not me, the videographer, or the organizers. People stepped in because the cause behind it is important to them. For me there’s a clear difference between a commercial and a personal project. A commercial project is one in which staff gets paid. A personal one is where you may get some money on the side, but it’s not how much you would normally charge. Julia Mesner, founder of Zero Waste Saigon had been following my past projects. In May 2018, she reached out to me on Facebook and asked what it would take to bring me to Vietnam. I thought straws could make for a fun project, so I asked her if she could collect about 100,000 of them. “No problem,” she said. And here I am. Most of my projects started out from conversations I had with people. I’d talk to anyone that says ‘hi’. I get a lot of messages and I try to be as responsive as possible. You never know where they could take you. I love this idea of serendipity. How did you bring Starbucks and Estella Place on board? Julia is the glue that holds us all together. She’s simply brilliant at reaching out and connecting people. She had been in contact with Starbucks about replacing their plastic straws with reusable ones and got them to sponsor the cost of the installation. Julia also helped connect me with Keppel Land, which is the real estate investor behind Estella Place, a new mall in the trendy area of District 2. I saw the potential of installing the art piece there because the area houses a demographic that has the privilege to worry about the environment. Estella Place initially offered us space on their fifth floor, which doesn’t get a lot of traffic. But as the conversation went up to higher levels of management, they decided to host the installation in their first-floor lobby, the most conspicuous spot in the building. Artist Von Wong as he stares into our consumer existences. Starbucks is a take-away brand and a big plastic straw outlet. Why involve them in Strawpocalypse? I’m in the camp of people who believe it’s important to work with corporations who are stepping in the right direction. Starbucks has recently been aggressive at fulfilling their many environmental initiatives, trying to bring systematic change to the tens of thousands of stores. Starbucks’s sponsorship means that we can take corporate money and use it for the good of the community. After all, companies are run by people. You can choose to criticize them all the time like you would to a child, or you can encourage them each time they do something right. Many people think the fact that Starbucks is a big plastic outlet disqualifies it from being part of the solution. However, if you look deep enough into this environmental catastrophe, every single person is generating waste and making the world a worse place to live in. Your mere existence is a consumer existence. Doesn’t that mean you should help solve it? What’s the role of Zero Waste Saigon in the project? Zero Waste Saigon does everything I can’t do on my own. Local preparation. Mobilizing people to help with large scale processes like collecting the straws and cleaning them. Speaking Vietnamese. Making impossible things possible. You entrusted a big part of your artwork to volunteers, which is not common for artists. Why is that? I like letting a community take ownership over my projects. It’s so rare that artists involve the public into the work process. Usually those doors are shut: the audience is behind a barrier and the cool activities happen on the other side. I want to break that barrier. I don’t think my art installations are brilliant. They are just a lot of work with a bit of creativity thrown in. I’m just a normal guy who had this random idea that somehow got this far, and now we’re all stuck here working together on it. The volunteers get to witness all the struggles and solutions. I think that experience empowers them to start work on their own causes. Some of them are already promising, such as Don Le, a TV show producer. After I leave Vietnam, it is my hope that these volunteers will stay here to act as agents of change in the country. What difficulties did you run into during the project? I had quite some trouble finding a prototyping service at a price we could afford, and outsourcing a LED designer with whom I could communicate in English. Gluing the straws took more glue than we expected. When the model was finally put together, it was more fragile than we had hoped for. The whole installation took more time and energy than we thought. There were also volunteer challenges. It was heartwarming to have all these people coming in to help, but sometimes we had so many we didn’t know how to coordinate them. These were the problems we had to as we moved to later stages. It looks like an art project but in reality it’s a problem-solving project. Are you optimistic about solving plastic pollution? Frankly, I think we’re doomed. I fall in between nihilism and realism. I understand it’s a hard battle to fight. On one side you have a minority struggling to give up convenience and alter lifelong habits. On the other side you have a wrecking population and a global economy that pumps 550 billion dollars into advertising new stuff. Everything we own eventually becomes trash. I don’t want my kids here and I feel wholeheartedly sorry for future generations. It’s such a colossal mess to inherit. They’ve got overwhelming problems to deal with. On the other hand, I still try so hard for all this. I’m betting all my power and privilege into making the right decision. I think it’s necessary to fight the battle even if you know you are going to lose. This is our home we’re defending. What else are you going to do — just sit back and relax? Even though the odds are stacked against us, I fight for the what-ifs. What if this becomes the first step in capturing massive attention, kick-starting movements, triggering conversations? What if these fragmented works add up to propel remarkable change? My hope is that the influence of my works exceeds my own projection, then it might get exciting. Fighting the battle knowing you’re going to lose. Your works have ignited conversations about plastic pollution, especially ones between consumers and sellers. Who do you think have more power to make the change? I don’t know the complete answer to this. Compared to individuals, companies are larger entities with greater impact, hence harder to change. Ultimately, there’s only one person whose thoughts and actions you have utmost control over, and that’s yourself. Whether it’s a conversation between consumers and sellers, among generations or countries, I don’t want my audience to dwell on the mentality of finger-pointing. I want them to focus on doing their part. What’s the ideal impact you want your art installation to have? Being an artist is difficult in the sense that you never truly know the impact of your work. I have no inventory to calculate or KPIs (key performance indicators) to measure. I’ve noticed that when I turn the lights on, people come over to see what this weird thing is. They start reading the sign. They seem intrigued. It’s doing its job of gathering traffic and catching attention. I hope the visitors feel something. If they do, I hope they reflect on their choices and drive the conversation further to the lives they can touch. Then again, some people started taking photos with a plastic cup and straw in one hand as I stood there thoroughly confused. There were 10,000 straws you didn’t use. What happened to them? And where do all the straws go after the exhibition? Our volunteers are folding the left-over straws into fish to give away to visitors as memorabilia, hoping those would be their last straws. At the moment, some straws are being transformed into roses for my photoshoot with The Bachelor Vietnam after my talk with Vietcetera. Honestly, we don’t know where the straws will go after the exhibition yet. We have two months to figure that out. With the launch of our video, we are trying to hunt for a forever home for our installation — an institution, company or museum who could house it permanently. That’d be ideal. Otherwise, we’re looking at options to dispose of it properly. That almost means leaving it where we found it, which we really don’t want to do.